Every Tuesday (And every day in March!!!!) I blog and share it with teacher-writers on the Two Writing Teachers blog. My Slice of Life today is inspired by the new podcast of the same title of the post. To listen you can find it here. Accept is my word today for today’s #Write28days. I need to accept some truths. I am contemplating and planning these GATHERINGS and I need to find the WHY. I think I have realized some truth after some journaling yesterday. One truth is I am an introvert so I need to carefully plan the execution of these events to not exhaust myself. I am super excited for my critique group video call this evening with Katherine and Marta. I am so honored to be writing friends with these ladies. I value their feedback and thoughts and they never steer me wrong. Storyaday.org’s Julie Duffy hosted a free writer Zoom call last night where 16 of us got together and wrote. It was wonderful to do 3 sprints together and I crafted a new short story! It took a surprising twist and direction. It is always fulfilling to talk story with other writers. The topic for the above podcast today is “Are you Lonely?” I love solitude but there are times I feel disconnected from people. On my commute this morning, I was thinking about being disconnected which is why I think I am pursuing the GATHERINGS idea. I want to have time to connect to other creatives for everyone’s creative well to be filled. Several years ago my life blew up and I was lonely because I was thrust into a situation where I knew NO ONE who had gone through the same thing. There was one person that had a small connection and I was rejected. Luckily, I found a group that supported me. I am forever grateful for this organization and they helped me from going into a spiral that would have not been recoverable. I have a literacy/coach meeting this afternoon with a consultant I adore listening to and working with. I am looking forward to the word for are going to do today! Connection for students is important and creating a feeling of belonging. I once named a remediation group “Writing Club” because I wanted them to come and I wanted them to enjoy the writing not get down on themselves for being selected for writing remediation. I wanted to instill an abundance mindset. Everyone wants to be part of a club especially one that you have a special invitation to! What do you want to tell me today? 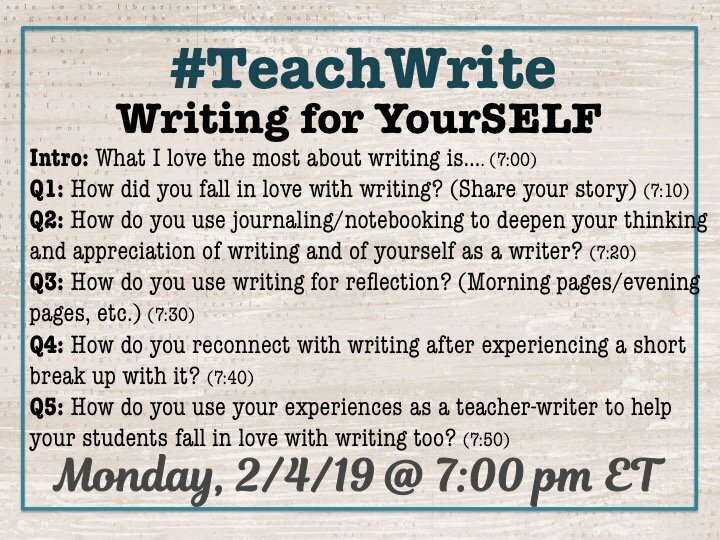 If you click on the banner you can read my guest post for the Teach Write Twitter Chat Blog!